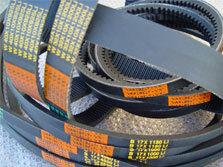 Outstanding durability, Particularyly on very small pulley diameters, with a minimum maintenance. Low-stretch tension member, high grade poly-chloroprene rubber compound, with a carefully determined fibre content, high performance, long service life, uniform belt geometry, high flexibility, maximum economy, temp. Resistance from -35C to, +100 C, limited oil resistance, antistatic, tolerance stable, matched sets without sorting.